The past few days have been rather hectic. There is a trend among all Indians to engage in what is called – Diwali Cleaning. It is a period of torture for the members of a house and one of exhilaration at the prospect of improved cash flow for the maids of the house. I was caught up in a similar quagmire, wherein the annual cleaning festival was happening in the house, and my participation was implicitly solicited. So battling the dust, in the garb of a terrorist, mercilessly exterminating tiny spiders and the occasional cockroach, by the end of the day, I was phooped! Not just because of the work, but on account of the incessant sneezing post the exposure to dust! So let alone blogging, I didn’t have the enthu for hogging! Ok, terrible rhymes apart the focus this week on What I Saw Wednesday is still on precocious kids. The other day, 2 little kids from an adjoining building came over to our place in the afternoon. One was perhaps 8 and another was 6 years old. They spoke perfect, fluent English – ‘Would you like some handmade paper weights?’. Well, these kids were tiny, and their fearless nature was very welcoming. So curious, we let them in. The paper weights were small stones – around 2 inches in diameter. Clearly they were picked up from a ground or a garden. These stones were washed, cleaned and painted. They showed us the merchandise. All paper weig hts had a theme. One was ‘ the Sun’. The object – look at the picture – was a stone, painted all blue, with a smiling faced sun, in yellow! Another w as a fish – and this was ‘sold out’. This was a stone painted in green, with small kiddie fish shapes painted in black. 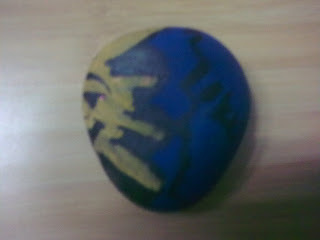 Another theme was – crab, a blue stone with an orange crab. The funniest one though was ‘Unity in Diversity’. A cleaned black stone, with the words ‘Unity in Diversity’ painted on it in a glittering red. Even cuter was their catalogue. They catalogued all these paperweights by theme name in a table along with a column that said – ‘available/ sold’. Once the sale was made, the buyer would need to strike off his purchase on the catalogue. The merchandise was definitely not a huge work of art, but the idea is to be lauded. When asked what the kids would do with the money, the 8 year old said that she was saving up for a gift for her mom’s birthday. Sweet! I remember roaming from house to house when we were kids collecting money for Helpage India or the Blind association. I was reminded of the number of aunties who’d had to pay up to a whole slew of kids who’d come knocking at their doors. And the aunties who’d mercilessly slam the doors on our faces, and the hushed ‘bitching’ we’d do about those aunties as to how mean they were and how they were ‘acting too smart’. We’d compete over who collects the maximum money, in a race where we'd implore all known individuals - who'd suddenly become known uncles or aunties or maybe even ultra close relatives to pleeeeeeeeease give more money, since ‘she or he who is my worstest enemy... (wonder why we'd always use terrible superlatives as kids) has collected more than me!’ And then would come the preening in front of the whole class as the teacher would call out the name of the kid with the maximum collection. So when these children came over to our house with this idea, I was reminded of the old times. Cheers to childhood indeed……. Real smart kids these days i must admit.. But they always remain cute. Glad you could portray it here with no bit of innocence lost in the translation. Cheers to childhood. yay! !